Osmosis is a physical process, in which water moves across a semi-permeable membrane from an area of low solute concentration to an area of high solute concentration due to the tendency to equalize the concentration on both sides. Osmotic power or salinity gradient power is the energy available from the difference in the salt concentration between seawater and fresh water. The underlying principle of the here proposed environmental art project is the phenomenon of osmosis and the possibility to use this natural process for energy generation. The design invites people to visit the unique landscape between Yas and Saadiyat Island in Abu Dhabi and to get introduced to a new clean energy production method: osmotic power generation. The design is a sequence of interwoven loops that form together the osmotic power plant. Each loop has its specific task and position within the system: The outer ring is an elevated viewing platform for visitors. From the shore just off the road that connects Yas Island and Saadiyat Island the loop with a diameter of 100 meters rises up to 6 meters above sea level and guides the visitors around the osmotic power plant. The viewing platform is a light steel construction with a minimal footprint that reaches like a pier into the water. The next loop is a seawater basin that is connected to the open sea and therefore in constant movement. Due to a relatively shallow shoreline it is necessary to excavate the seawater loop to reach the required depth. 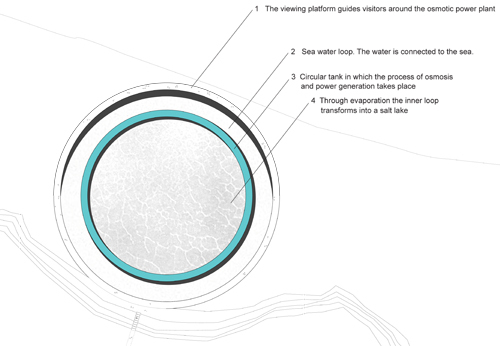 The loop of seawater surrounds a circular tank with a width of 3 meters in which the process of osmosis takes place. The tank consists of a semi-permeable membrane at the outer wall, a chamber for water with a high degree of salinity and in the top turbines that generate power. The inner loop of the proposed structure is a salt lake. Via controllable feedings seawater is diverted into the inner loop. The seawater here is stagnant. Through evaporation caused by the sun the inner loop transforms into a salt lake. The water in the salt lake has a higher salt concentration than the surrounding seawater. The geometrical arrangement of the interwoven loops -each of them with its specific position, color, texture and function- form an alien shape in the landscape of Abu Dhabi. It shall attract people and stimulate their curiosity to explore the Osmotic Loop at close range. Once inside the Osmotic Loop people will become aware of a natural phenomenon that has the potential to contribute to the mitigation of climate change. The seawater in the outer loop has a lower salt concentration than the water in the inner loop, the salt lake. The seawater in the inner loop is stagnant and due to evaporation a salt lake occurs. The tank is filled with water from the salt lake. Via a semi-permeable membrane water enters the tank because of its tendency to equal the difference in concentration. This process is called osmosis and the basic principle of the proposed power plant. As a consequence the water level and the pressure increases in the tank. When the maximum pressure is reached valves are opened and the water escapes from the tank and activates the turbines that generate power. Pressure and water level decrease in the tank. New salty water from the salt lake will be filled in the tank and the process can start again. Underneath the tank are two controlled locks that connect salt lake and seawater loop. The salt lake has to be supplied with seawater to prevent the drying-up and to keep the water level constant. Water escapes every eight minutes from the tank with high pressure like the breath of a living organism, forming a fresh fog around the inner of the Osmotic Loop, providing the visitors with a cool breeze. The enormous potential of power generation through the natural process of osmosis is indisputable. But efficient and profitable osmotic power plants that can be installed on a global scale are still being tested and developed. Energy supplier Statkraft has now built the first prototype in Norway with an installed power of 10 kW. The ambition is to build a full-scale osmotic power plant with 25 MW in 2015. (www.statkraft.com). The prototype in Norway uses the local condition of a river that flows into the ocean. In this situation the two important components -water with a low degree of salinity and water with a high degree of salinity are given.